Alyssum is a genus of flowering plants that can be annuals, perennials or shrubs. They are native to Europe, Africa and Asia but are commonly grown in North America as an ornamental flower. 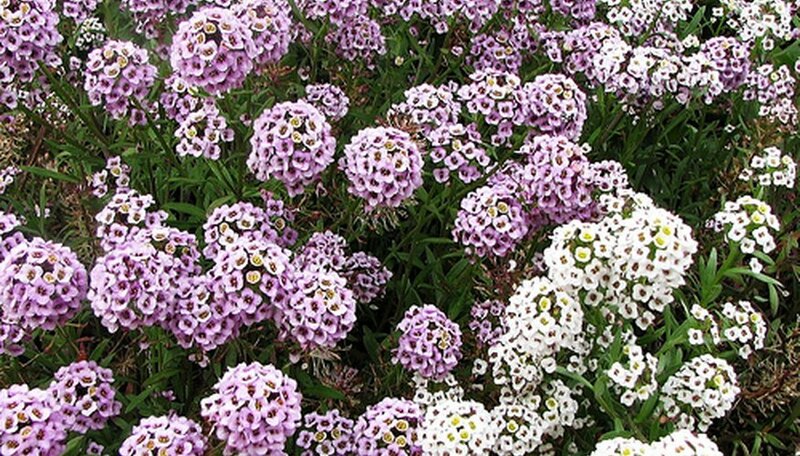 Alyssum plants produce long, oval leaves and flowers that can be pink, purple, yellow or white in color. Most alyssum flowers grown in the United States are annuals, as they usually cannot survive the cold winters. Plant alyssum during early spring in a location that receives full morning sun and afternoon shade. Use a soil made up of two parts gardening soil to one part peat moss for extra drainage and fertility. Water alyssum three to four times a week for the first two to three weeks of growth. Reduce watering to one deep soak per week during dry periods after the first few weeks. Do not water alyssum on weeks that receive at least one inch of rainfall. Sprinkle water over alyssum plants during extremely hot and dry summer days to prevent wilting. Use enough water to moisten the soil and dampen the foliage, without the soil becoming soggy. This will keep the plant from drawing back and ceasing growth during the summer. Feed alyssum using a balanced 10-10-10 NPK fertilizer once every two months. Do not fertilize during winter, as the plant will not use the nutrients. Water thoroughly after applying to incorporate the fertilizer into the soil. Follow the instructions on the packaging for proper dosage. Spread a two-inch layer of mulch around alyssum plants, starting at three inches away from the stems. This will allow room for growth, conserve moisture and reduce the threat of weeds. Refresh the layer of mulch once every two months, or when it becomes visibly eroded. Remove dead flowers as soon as possible to encourage the growth of additional flowers instead of seeds. Straw and grass clippings make ideal mulch for alyssum.